The guy who is credited with coming up with the technique is Malaysian birdwatcher by the name of Lawrence Poh. He came upon the idea in 1999 and has been perfecting it ever since. The idea of digiscoping is pretty elegant: point a camera at the eyepiece of the telescope and take a photo of the image as seen by the eye. However, digiscoping only became practical with the advent of small digital cameras, which provide the ability to immediately see the results and to make in-use adjustments. 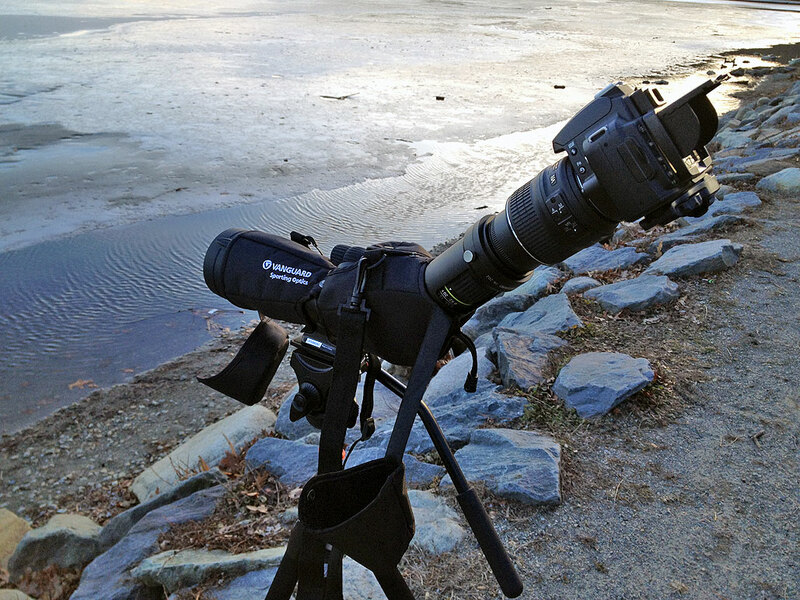 The technique has become so popular that better quality scopes even have custom adapters for mounting DSLRs to the eyepiece. 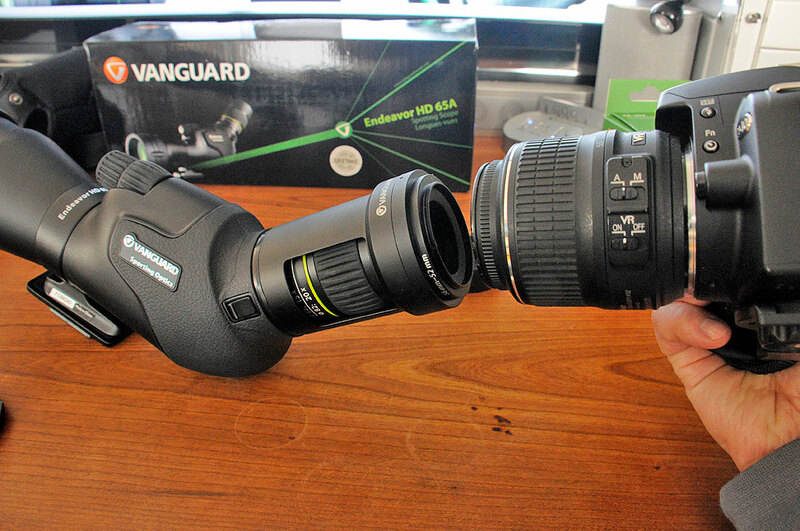 The Vanguard PA-202 is a custom adapter specifically designed to work with the Endeavor line of spotting scopes. One end threads into the body of the scope. The other end threads into the lens of a DSLR like a filter. 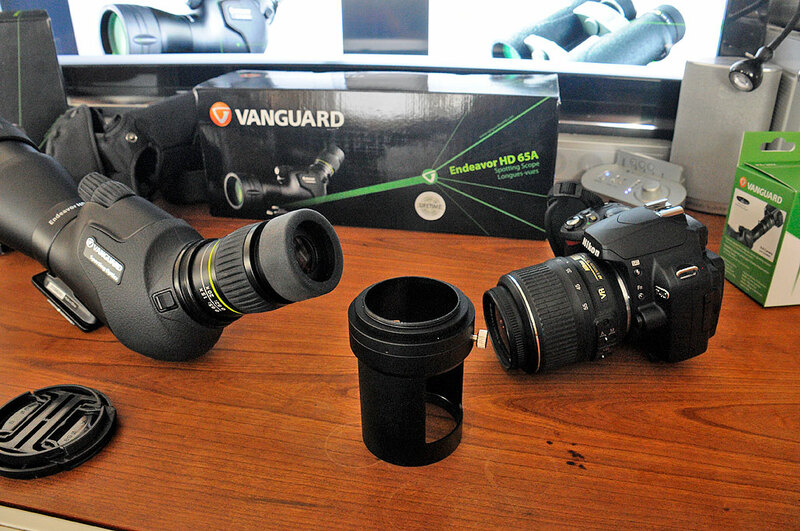 It also comes with a 58mm-52mm adapter to step it down to smaller lenses. We are using the Nikon D40 and 18-55mm lens because the lens has a 52mm filter thread. The whole setup is quite the contraption when we had it all together. The reservation we have with the setup is that the weight of the entire camera is supported by the front lip of the lens. We took care not to bump into it as we were a little worried about the amount of stress placed on the zoom lens. BTW, we have 49mm adapter ordered to see if we can make the setup work with the lighter Fujifilm X100S camera. Below are some of the shots we took with the digiscope setup. Different effects can be created by going wide or zooming in with the Nikkor 18-55mm lens and adjusting the zoom of the eyepiece. We did notice the autofocus wandered a bit before locking down on something. After a few shots, we found it easier if we went completely manual. The results were encouraging, but we think we could get sharper shots if we play around with it some more. We like this new technique and will be spending some time shooting out the window for practice! However, we need to play with the technique a LOT MORE before things become second nature.